Conveniently located smack in the middle of the busy Waikiki tourist strip is a little Japanese resturant recessed into a cozy little spot. Opening later than most places around for lunch, we happily popped our heads in after shopping and walking around the Waikiki section during our trip to Honolulu back in May 2010. 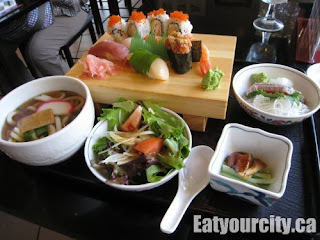 We came back a few times to grab a quick lunch or snack as it was reasonabley priced sushi in a convenient spot. When you walk in, you're greeted by a small sushi bar on your left and a few tables fanning out infront of you to the right. Service is prompt and courteous. The manager was happy to spend a few minutes telling us about his resturant and how his main chef will always toss out ingredients or the sushi rice if he felt it wasn't up to standards. Portionwise, expect sushi nigiri and sashimi cuts to be in the "fusion"- California/East coast style sizes. In otherwords, a bit smaller and narrower than the traditional sizes. All seafood was fresh, though nothing really stood out as outstanding. The rice used in the nigiri had a nicely balanced tangy-sweet without being too mushy or hard. The ahi poke (pronouned poh-kay) was one of the best ones we've tried in Honolulu. Poke is a seaweed salad generally served with diced or chunked bits of lean ahi tuna. 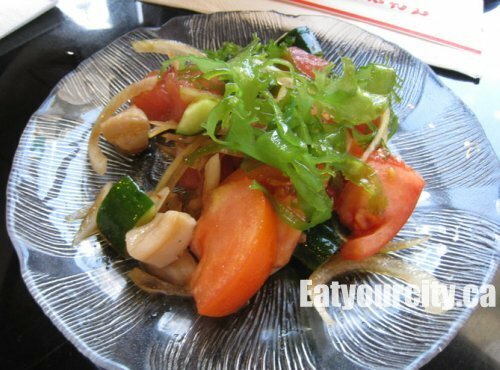 Furusato's version is refreshingly tnagy with green and red seaweed, tomatos, shaved sweet red onions, bonito flakes, blanched clams, marinated squid rings and drizzled with a soy based dressing and sesame oil to add just enough richness to the super lean ahi tuna sashimi prevalent in Hawaii. We're used to the rich, fatty tuna from Italy and Japan, so the super lean ahi tuna found in most Honolulu resturants was unpleasant and almost dry tasting on nigiri or as sashmi, so serving it as a poke is genius. Furosato's bento boxes are pretty standard fare, but a good deal for lunch for two. The bento box clockwise from top left: the mandatory californian rolls, ahi tuna, scallop, spicy tuna and shrimp nigri; ahi tuna sashimi on a bed of shaved daikon; seared mackeral on a bed of lettuce; green salad with sesame-soy based vinagrette; bowl of udon in bonito based broth - All for $35US. 1) Intrigued by the heavily marbeled Hawaiian raised beef (what cattle wouldn't be heavily marbeled if they finish with grazing on tropical plants instead of corn, grain or grass? ), we had the seared Hawaiian beef nigri with some green onions to garnish. Unfortuantly, it was sort of tough and difficult to bite into as the slice was fairly thick and sliced from a flank cut instead of a more tender cut. I think they would be better off serving it as a tekakki rather than a nigiri. 2) The O-Toro nigiri: Though not the best O-Toro I've had, the texture was a bit mushier than I would have liked, indications of either overhandling or it was sitting out defrosting a bit too long. Still, its not bad at $11 a piece, its about mid range for pricing. 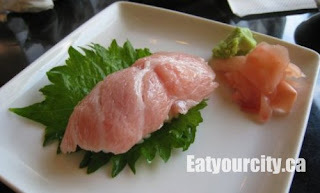 Quibble- chewy and tough hawaiian beef nigiri special, hit/miss freshness in sashimi selection, 7/10. Overall, better than the run of the mill Japanese places that seem to be on every block, and Furusato at least attempts to retain some traditional elements despite being in a tourist heavy area where they can easily cop out and serve mediocre fare to unsuspecting customers. A good, convenient place to pop in for a quick lunch or snack to go. I'd stick to the "high volume" items the mainstay of the customers order like the bento boxes as the specials were hit and miss in terms of freshness.